At a highly-anticipated Borderlands 3 reveal event at PAX East in Boston on Thursday, Gearbox had all eyes on its stream as it premiered new trailers and information about the game. Unfortunately, excitement for the title itself may be overshadowed by the blemishes and obstacles Gearbox had to navigate throughout the show. Though perhaps not quite as tragic as Konami’s infamous 2010 E3 conference, Gearbox’s 2019 PAX East blunder will certainly start appearing on “Top 10 worst gaming conferences ever” lists on a regular basis. From excitement-draining magic tricks to Windows Media Player cameos, here’s a chronological timeline of most everything that went wrong for Gearbox, as told through the eyes of popular streamers that witnessed it happen live on Twitch. Early in the show, Gearbox’s head of publishing Steve Gibson took the stage to preview some upcoming games. As he spoke, his microphone constantly rubbed against his face, causing annoying and abrasive sounds for the audience to listen to. Whether his mic tape fell off or the production crew forgot to give him some, KingGothalion did not enjoy the experience. #3: What Happens When You Open a Discord to Thousands of People? Gearbox members later announced that an official Borderlands Discord server had been created that would feature AMAs with developers, SHIFT Key giveaways, and more. One streamer, twomad, joined in immediately, and things were running about as orderly as you could imagine. Finally, after card games and a few smaller game announcements, the show turned its full attention to Borderlands. There were some updates on Borderlands 2 VR, and then a trailer rolled. Well, maybe “trudged,” is a more fitting term here due to its horrible frame rate. Watch DansGaming react to the world premiere of the Borderlands 1 remaster end before the storytelling even beings. But fret not! The PAX production team assured Gearbox and Pitchford they had remedied the poor frame rate. Finally! The team can relax and let the world see a remaster of a beloved game they’ve been working so hard on! Little did they know the problem was not solved at all and that their embarrassment was only getting worse. Watch alongside Tim “TimTheTatman” Betar and Admiral Bahroo in disbelief as the trailer is attempted to be played, yet again. #6: Surely This Can’t Happen For the BIG Reveal, Right? Yes. Yes it can, and yes it did. Pitchford and company returned to the stage to verbally inform the audience about the remaster and free updates coming to Borderlands: The Handsome Collection. It was finally time for what everyone was there to see: the premiere of Borderlands 3. 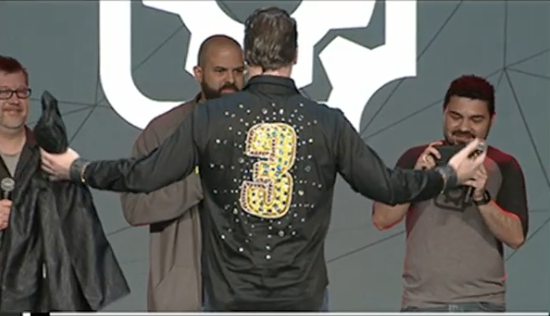 Pitchford took his jacket off to reveal a bedazzled “3” on his shirt, and then, it was time to reveal the game to the world—in stunning 10 frames per second. Understandably, the CEO of the company that was suffering from horrible production quality at one of their most important events of the year wasn’t too happy. After trying to play the Borderlands 3 trailer yet again, and seeing it suffer from the same issues, Pitchford had had enough. “We should’ve brought our own equipment, right?” he said, visibly frustrated. Eventually, the trailer ran in its intended frame rate and the crowd was amazed. More than likely, Gearbox will use this flop of an event to their advantage in future promotional and marketing efforts. After all, Borderlands itself has a rather self-aware and funny attitude. At the moment, Pitchford and his team likely wanted to curl up into a ball. Once they sleep on it, they’ll likely realize that no matter what, fans are still rabidly excited for the new Borderlands game. Plus, no matter what they do for the rest of the company’s existence, Gearbox’s 2019 PAX East conference will be forever ingrained in video game history.